First, grab a set of espresso cups from Ikea. They’re the perfect size for tiny hands, and $1.50 for a cup and plate. Grab a tea pot and saucer while you’re at it for $5 and you’ve got yourself a nice little tea set. Then we grabbed Martha Stewart Opaque Glass Paint, which comes with the perfect tip already installed for small flourishes. They come in pretty much every color so you can get really creative using your girl’s favorite color, a multi-colored mural, this is just the type of thing that could turn into a treasured family heirloom, but today – purple it is! 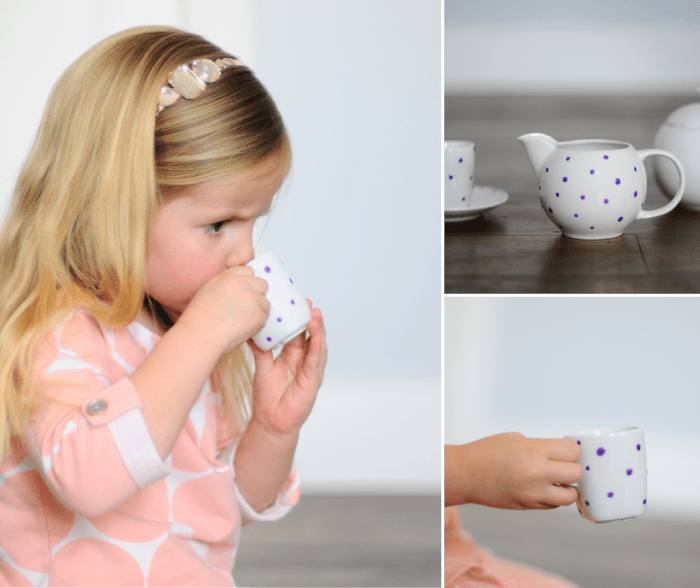 We had a few patterns in mind, but ultimately had to go with this sweet little polka-dot pattern. Squeeze the bottle gently and the tip creates the perfect little raised dot, no problem. Best part is, if you over-do it, you can wipe it off and try again without any streaking! Just use a clean paper towel. When you’re done, you’ll have a pretty impressive set like this! After reading reviews of the paint we followed one tip to let the paint cure (air-dry) for an hour, and then bake as directed. Another great tip to keep the color virbant was to put the set in a cold oven, then turn it on and let it pre-heat with the set inside. Once the oven reaches the instructed temperature then you’ll set the timer for 30 minutes. If we’re being honest, our boys had the best time playing tea party, but we figured they might not want those photos on the internet ;), so here’s our sweet little lady-friend Stella taking it for a whirl. We love they way these projects add a little personalization to simple pieces. 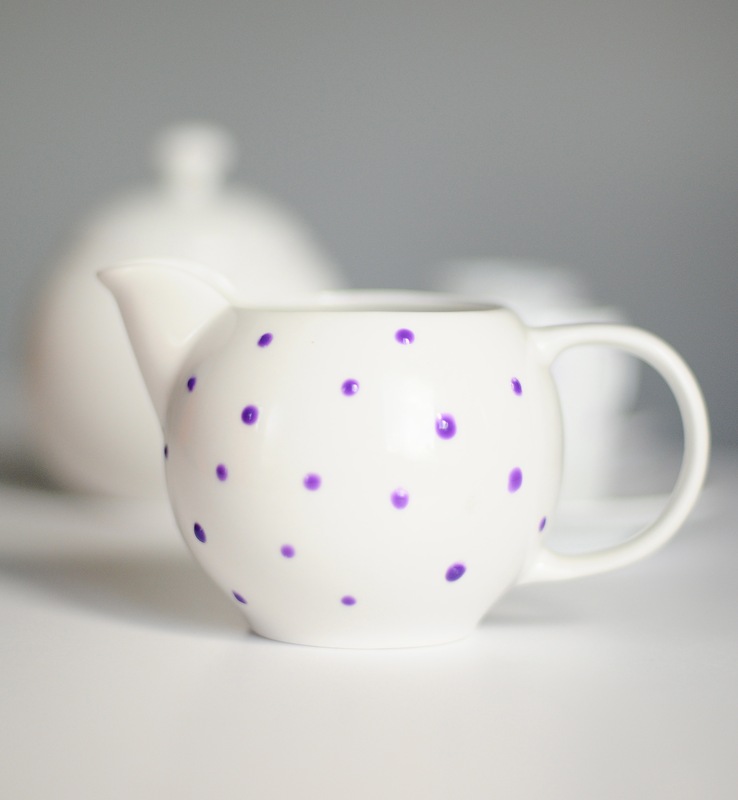 Check out our other projects with ceramic paint here and here! Now let’s check out what our other link-up geniuses have created for this challenge today! We have fallen in love with each blog since starting this challenge and know you’ll all love them too, click right on the image to be taken to the corresponding post! Flat out adorable! Would love to make this for my sweet little niece! Oh my goodness! This is absolutely precious! This is a sweet series! I am loving the inspiration from each topic. The tea set would make for a darling gift. Thanks for the idea! cute, but i’m a little turned off that you say the boys were having fun but you wouldn’t post pictures… reinforcing gender stereotypes much? if they had fun, that’s great… no reason to hide! I totally agree with you! I just meant that because photos stay on the internet forever, they might be embarrassed by it later (like 10 or 11) so why make that decision for them? If we ever have a feeling not to post a picture, we just don’t. But, we definitely don’t enforce gender stereotypes in everyday play. 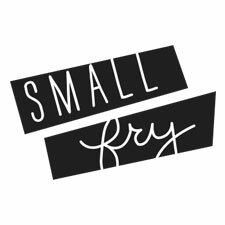 Thank you for your input and for reading Small Fry, we appreciate it! Pingback: Personaliza los juegos de café y té más sencillos | Blog material para manualidades "Con Idea de…"
La verdad es que te quedó estupendo, felicidades! Thank you for the inspiration !! I am hosting a shower for a gal pal expecting a lil girl … each guests is going to decorate a cup for her to play with in the years to come. Thinking the mama bear will decorate the tea pot !! So excited to see it all together. Thanks again.